Republican Greg Gianforte assaulted a Guardian reporter the day before his election. 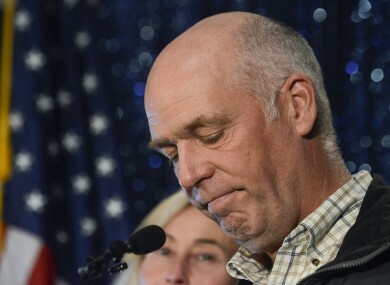 THE US STATE of Montana’s next congressman, Greg Gianforte, avoided jail time today after pleading guilty to assaulting a reporter the day before he was elected. Gallatin County Justice of the Peace Rick West sentenced the Republican technology entrepreneur to 40 hours of community service, 20 hours of anger management counseling and ordered him to pay a $385 fine for the misdemeanour (around €344). If he remains law-abiding for 180 days, he can petition for the conviction to be removed from his record. Gianforte’s attorneys noted that he had already paid more than $4,600 in restitution (around €4,106) to Guardian reporter Ben Jacobs for the assault, which cast a pall over his 25 May victory to serve the remainder of Ryan Zinke’s term. Zinke resigned to become Interior Department secretary. Gianforte, 56, is expected to be sworn in to the state’s sole US House seat later this month. Jacobs said Gianforte knocked him to the ground when he asked the candidate a question 24 May. Audio taken by Jacobs recorded sounds of a scuffle, followed by Gianforte yelling for the reporter to “get the hell out of here.” Gianforte was cited that night. In an attempt to put the matter behind him, Gianforte first settled all civil claims with Jacobs before requesting that today’s court date cover both his arraignment and sentencing. In exchange, Jacobs agreed not to sue Gianforte and said he would not object if Gianforte entered a no-contest plea to the criminal charge, which would have allowed Gianforte to concede to the charge without admitting guilt. But Gallatin County Attorney Marty Lambert said on Friday that he had not agreed to any deal in which Gianforte would plead no contest. Gianforte, who sold the software company he founded to Oracle for $1.8 billion in 2011, won his first political office over Democrat Rob Quist after a short but intense campaign set off by Zinke’s appointment to the Cabinet post by President Donald Trump. The special election drew millions of dollars in donations from across the US. Email “Republican who bodyslammed reporter sentenced to 20 hours of anger management”. Feedback on “Republican who bodyslammed reporter sentenced to 20 hours of anger management”.